The heart of bohemia in 1960s New York, this lower Manhattan neighborhood has the Dutch and the British to thank for its name. Greenwich comes for the Dutch word “Greenwijck” which means “Pine District.” When the Dutch ran New York (or New Amsterdam, as they called it), a Dutch man named Yellis Mandeville purchased property in the Village. He allegedly renamed the area after another village on Long Island by the same name. The first recorded appearance of this name change appeared in Yellis’ will at the turn of the 1700s; the name has since been Anglicized to Greenwich. 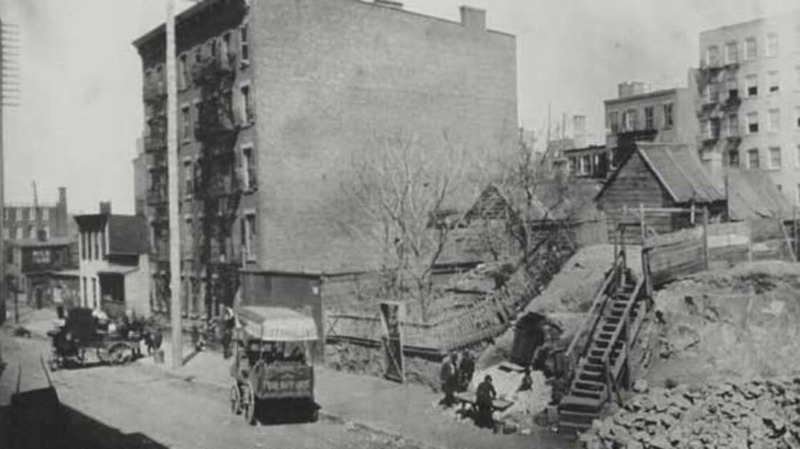 "The Village," as it's often now called, extends from 14th Street to Houston Street and from Broadway west to the Hudson River. Only one square mile, this midtown west area located just below Times Square (from 34th to 40th Streets, between Sixth and Ninth Avenues) housed half of New York City’s garment plants in the early 20th century. In its heyday, the Garment District serviced all facets of the fashion industry, from design to manufacture to sale. Most of the manufacturing business has since faded away from the area, but its historical contributions live on through the name—and a giant needle and button sculpture on 7th Avenue. The Heights formerly known as Vandewater, from the name of Dutch settler Harmon Vandewater, became Morningside around the time Columbia University was expanding into the area (around 1896). A city surveyor appraising the surrounding land found one spot he deemed unsuitable for anything other than a city park. This particular park was situated on the east side of a hill, perfectly positioned for a nice wash of sunlight every morning. In 1870, the city named it “Morning Side Park,” and it is believed to have inspired this particular Heights’ new first name of Morningside. The neighborhood's current boundaries are 110th to 125th, from 8th Avenue to the Hudson River. These areas along the East River aren't technically bays, but that didn't stop residents from using the word. When the New York Times moved its headquarters to then-named Long Acre Square in 1904, publisher/owner Adolph Ochs strongly encouraged Mayor George B. McClellan, Jr. to change the name to Times Square. McClellan agreed, and it was henceforth Times Square. Today, the tourist trap—and the 'hood most dreaded by New Yorkers—stretches from W. 40th Street to W. 53rd Street between 6th and 8th Avenues.